We design and facilitate conferences, workshops and team meetings (virtual and face to face), ranging from highly strategic interventions such as working with leadership teams to develop a new strategy and agenda for change, to more tactical interventions such as a project team that has difficult issues to resolve. Whatever the need, we aim to engage everyone to make a difference. HuP Communities of Practice which are focused on sharing knowledge and building understanding to help promote consistency in the application of HuP across the business. 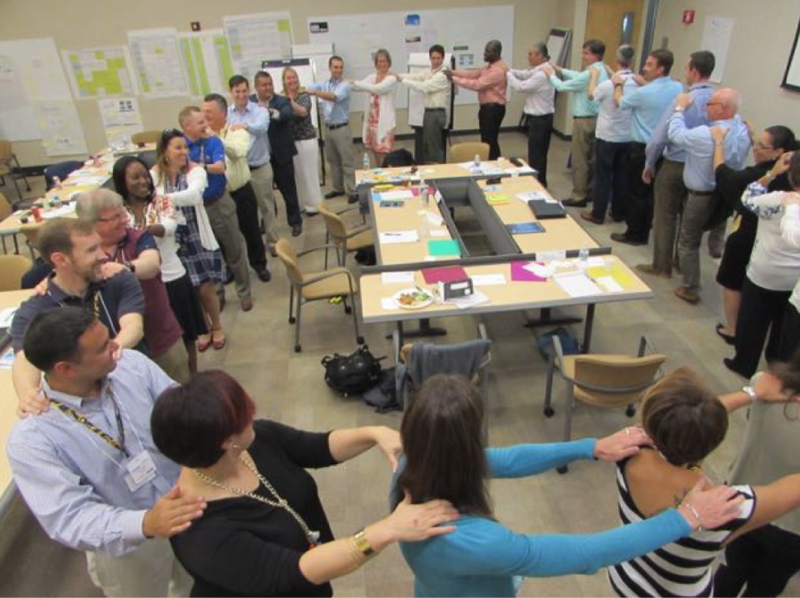 We have facilitated groups of up to 200 people around the world. However, no matter the size of the group or the task, the goal remains the same: to deliver an outstanding result every time. We bring challenge, external perspective, balance, energy and structure to every event. Our approach delivers a deep commitment to making things happen – frustration and disappointment are things of the past! keeping a finger on the pulse after the event to ensure that results are delivered. Perhaps in your organisation you have heard yourself and others say "What a complete waste of time!" after yet another unproductive meeting or workshop. If so, then you might also like to consider why it is allowed to happen: is it habit? (its just the way it is and always will be) lack of skill? lack of leadership? Or is it all of these things and more? We all attend and lead meetings of one sort or another and for some roles, the working day may be taken up entirely with meetings. Sadly, in our experience, most meetings would typically score 5 or 6 out of 10 in terms of effectiveness so there is plenty of scope for improvement; the savings in time alone make it a "no brainer" business case for change. However, even when common sense guidelines on meeting management have been followed, success is not guaranteed. The answer lies in using a facilitator or having highly effective meeting leaders well trained in facilitation skills. and ensuring an action orientation on completion. offer ideas around making similar events in the future even more successful. We strike a balance between achieving stated goals and making the event enjoyable - clients find this combination generally delivers the best results. One of the main obstacles in making use of a facilitator is that it appears to be an admission of failure on the part of the event leader. Nothing could be further from the truth. Using a facilitator is about getting the best out of any situation, especially when the stakes are high – surely that can't be wrong. Gerry is a professional facilitator with the magic touch. He has a way of deepening the sense of purpose of a meeting and focusing minds while at the same time maintaining high spirits and energy levels throughout with all manner of energisers. Strongly recommended."